How to Make Ghee at Home. Step by Step Tutorial. This easy step by step tutorial will teach you How to Make Ghee at home. Stop spending a fortune on packaged Ghee and make your own in no time! Ghee is essentially clarified butter that is cooked a bit longer until the clarified butter is golden and the milk solids at the bottom are toasted (but not burnt!) and then strained off. The milk solids contain the casein and whey protein, which for a lot of people, is what causes dairy sensitivities and digestion issues. So, in short – Ghee is butter oil. You may be thinking, “Why go to all that trouble?” There are so many reasons to go to the trouble! Another fabulous reason is that Ghee has a very high smoke point (450F) so it makes an excellent replacement for vegetable and seed oils (canola, sunflower, safflower, etc.) if you are trying to get away from using them. Ghee adds depth and complexity to what could otherwise be an ordinary dish without making things too complicated. While in the past, I used to occasionally use Ghee in my kitchen (for specific dishes), I now have been using it frequently and love it. It’s here to stay! Heat a wide-bottomed pot with high sides (for splashing/bubbling) over medium-low heat. Once hot, add cubed butter. I usully cut into 8 or 10 pieces. Use a wooden spoon or spatula to stir the butter and speed along the melting process. After 5 minutes (almost melted). Once butter is completely melted and begins to bubble, very slightly lower the light. You want a steady bubble but not so much that butter is jumping out of the pan or spraying on the stove top. Cook for 25 to 30 minutes or until the milk protein has completely separated and there is a layer on the top and bits on the bottom of the pan. Next are a series of photos showing the process. Begin carefully skimming the top layer off until Ghee looks clean (except for bits on the very bottom) and discard. Slightly raise the heat back up to medium low and continue cooking another 5 to 10 minutes until most of the bubbling stops and the milk protein bits on the bottom of the pan begin to brown. Do not let them burn! Immediately remove the Ghee from the stove top and set somewhere to cool. Once cool, strain through a fine mesh strainer or cheesecloth. Discard the toasted bits from the bottom of the pan. 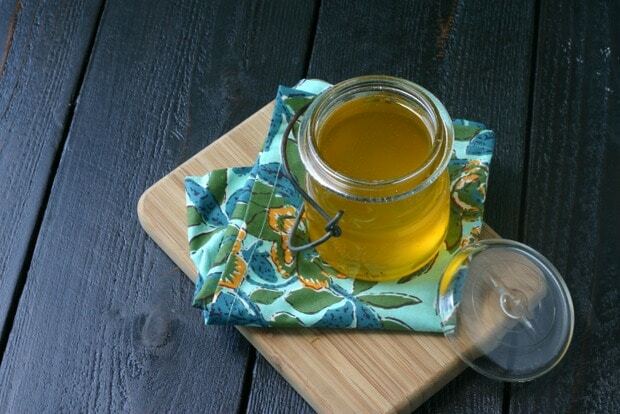 Store Ghee at room temperature in a glass container or mason jar and use as needed. That's it. I included a lot of pictures because while it sounds simple, it took me a couple of tries to get it perfect and I thought for this one, more info was better. Enjoy! Traditionally, Ghee is made from unsalted Butter. While I have made it from both salted and unsalted and do prefer unsalted, I have been making salted most recently because Costco has a great deal on grass-fed Kerrygold butter but only the salted. To me, the quality of the butter is more important than if it is salted or not. Bottom Line: Get the best quality butter you can - preferably local and pastured but at a minimum pastured and free of antibiotics and hormones. I like to store Ghee in a small mason jar or glass container at room temperature. It doesn't need to refrigerated but some people do prefer to store it in the fridge where it becomes solid and can be used a spread. The Ghee in my main photos was still a bit warm so completely liquid. It will solidify a bit at room temperature. If this is your first time making this, I recommend sticking with just 1 pound of butter as it is easier to manage. Once you get the hang of it, double or triple the recipe and then store the additional jars in the back of your fridge until ready to use. 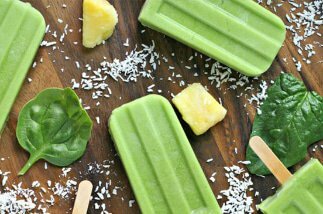 UPDATE NOTES: Please note that this recipe was originally published in April 2014, but was updated in October 2018 with nutritional information, recipe tips, and more helpful information. This is so helpful!! I’ve been wondering about this, and would much rather make my own, so thank you for your help! You are so welcome! It’s so easy and such a $ saver! Such clear, concise directions! My ghee was perfect! Fantastic to hear!! Thanks for taking the time to let me know! I have been throwing 2 bay leaves in the pot when cooking.I started this after reading a india recipie, it enhances the ghee but not overpower the flavor. Is the glee just used for cooking or used like tub butter on top of cooked food? Hi Debra, you can use Ghee for cooking (great for high heat cooking) or like butter or even medicinally on cuts. It’s amazing! Hi Scott! Yes, I have frozen it before. I think the recommendation is no longer than 6 months. 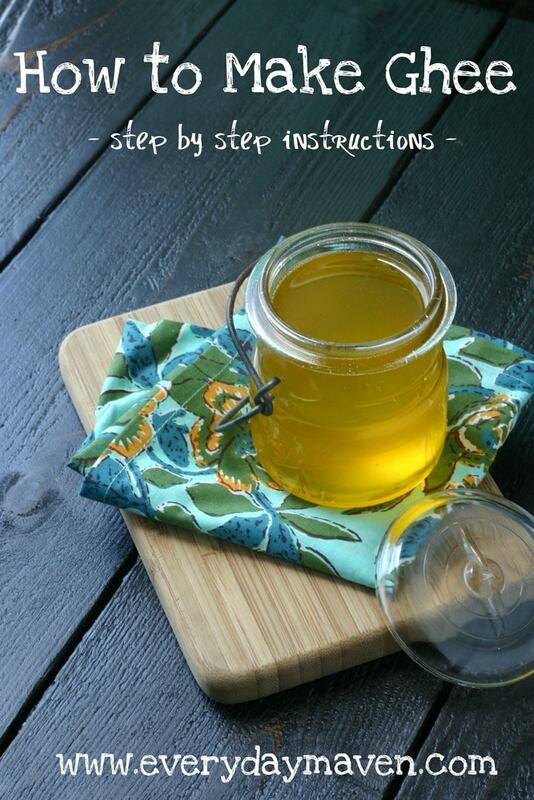 OMG what a great post on how to make ghee. I just started Whole30 and followed a recipe said to make it in a slow cooker, which I did, so you didn’t have to stir and really keep an eye on it. I made 2# of Kerrygold salted butter from Costco. When it was done, I skimmed all the foam on the top like your photo in #6; then lined a strainer with 2 coffee filters into a 4 cup glass measuring cup. It initially dripped pretty fast, then the drip really slowed down. I poured out the melted butter into a bowl and changed the coffee filters as I thought it was getting clogged. I had the air conditioner on all along and had to run out quickly; however, instead of the rest of the melted butter dripping, quite a bit had solidified in the filter. Should I reheat the one the solidified in the filter and strain again? 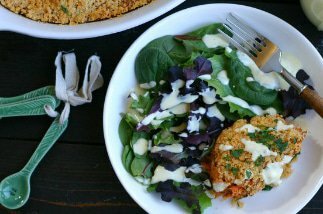 New to Whole30, but can’t seem to ‘sign in’ to their website and thus can’t ask anyone there. Would really appreciate a quick response. Hi Robbie – Congrats on doing the Whole30! I would probably reheat to liquefy and strain again. Hope that helps! What is the difference between browned butter and ghee? Hi Melanie – Ghee is clarified butter, meaning the milk solids are removed. Brown butter is butter where the milk solids are left to brown and add flavor. I thought Clarified butter was butter with the milk solids removed before browning and ghee left in the solids maybe 30 seconds longer to brown and produce a more nutty flavor. Don’t know what went wrong…but I’ve got burnt melted butter. ugh..
That is such a disappointment! If the ghee is burnt, are you able to use it still? Just a guy that needs ghee twice a day. I read through the instructions once. The photos helped a lot. First time and Perfect! Thanks for the knowledge. Now I know. I’ve been looking for ghee to buy for months, but can’t find any. Finally decided to try to make it myself! Maybe my husband will use this instead of insisting on using darn becel! Can I use coffee filters to strain the ghee? Or do I need to go out and buy cheesecloth? Thanks! Hi Denise! Coffee filters should work just fine! Hi! I just made this and I forgot to let it cool before I strained it. I used 16 sticks of organic valley butter. After I did everything…it cooked for a long time and I could just see the bottom, though not enough to discern a color. I decided it was done because it had been going for over 40 minutes. I thought maybe because I used so much butter is why it was hard to see everything. When I strained into my container (which is ceramic and not see through) there was hardly anything left on the bottom of the pot. Maybe two table spoons of white solids. I did skim a lot off the top. Do you think this is because I didn’t let it settle? Will my ghee spoil? It sounds like it turned out perfect. 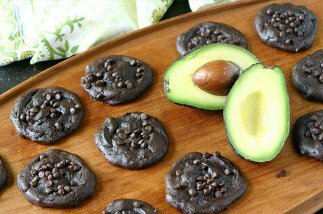 As long as it doesn’t taste burnt or you don’t see white pieces in there, it should be good! I used your recipe to make ghee two days ago, but though I cooked it pretty long and the bubbles disappeared; then came back and dissapeared again, the milk solids didn’t brown… I was afraid to overcook it, so after over 30min I took it off the stove. The milk solids had all sunk to the bottom, but were still white. They looked like the white stuff you skimmed off in your pictures, but in my case, they had all sunk to the bottom. They stayed behind in the cloth when I filtered it, and now what I have left is a golden colour and clear, so should it be okay? is it important to have brown milk solids just for the taste, or did I do something wrong? Thanks for the straightforward recipe. I’ve now made ghee a couple times, and made 8 lbs. this time. It stores well for months, and I store it at room temperature. Just tried it for the first time. I was a little nervous because we use an induction stove which cooks a little faster than a traditional stove. It did cook faster. When I turned my heat back up in one of your later steps, it never stopped bubbling, but instead created a froth-like foam on top. I skimmed it and noticed the bottom was beautifully browned. It smells wonderful and I can’t wait to see how it turns out! Hi Marie! So glad to hear it worked for you on your induction stove!! If you use 1lb of butter, how much ghee should you expect to get? You should get just a couple of Tablespoons shy of a pound. I made ghee last night and I thought it was supposed to remain liquid, so I put it in a beautiful narrow-mouthed bottle. When I found that the ghee is supposed to solidify, I was relieved, but now I wonder if it’s ok to re-heat it so that I can remove the ghee from the bottle and store in a wide-mouthed jar. Hi Karen! You can reheat it. What I would recommend is just sticking your jar in some warm/hot water until the Ghee loosens and you can pout into another container. I like to use wide-mouth mason jars. I made my first container (kerrygold) last night. This morning, it was cloudy. I think I may have cooked it for too short a time. Can I salvage it? Hi Susan – I would try redoing it but with a very low light! Low heat Susan – sorry if that confused you! As Ghee cools, it does turn cloudy. It is never a clear product unless it is hot. The most important part is to make sure the oil stops making bubbles, which is the water that was in the milk boiling off. For Ghee to last, all this water needs to be gone. The pictures are nice. I have just made this and am curious as to if it should stay liquid or does it solidly when cooled? Hi Anne! It should solidify when cooled (unless your kitchen is super warm!). Thank you!! Mine solidified in my pantry and I was worried I had done something wrong! I am so excited to use it. Making some chapati’s this week and wanted to brush them with it! Do you continue to stir it through the cooking process? I do but many people don’t. It’s totally up to you. If you leave it alone over a nice low light, it’s just fine! do you think step 6 is necessary? all was going well with some nice organic unsalted butter, but that last step the butter did seem to burn without my even seeing it do so….that is everything turned brown which i dont mind but then it didnot smell good anymore…..hmmmmm…..